Got a Busy Week? There’s a Weekly Planner for That! 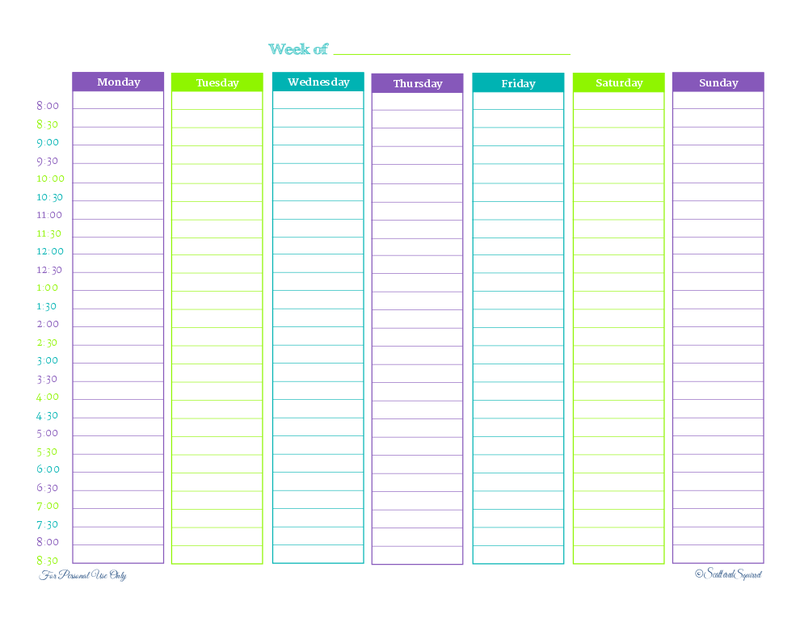 Last week I shared with you the Weekly Overview printable I made. It’s still working great, but for these busy weeks, it really has become nothing but an overview. There is so much going on that there just wasn’t room to put it all on the planner page, at least not in detail. I knew this was going to happen. There are going to be weeks where there is lots happening and more room for planning is going to be needed. For those weeks, the Overview on its own just won’t cut it, but I think one of these might! 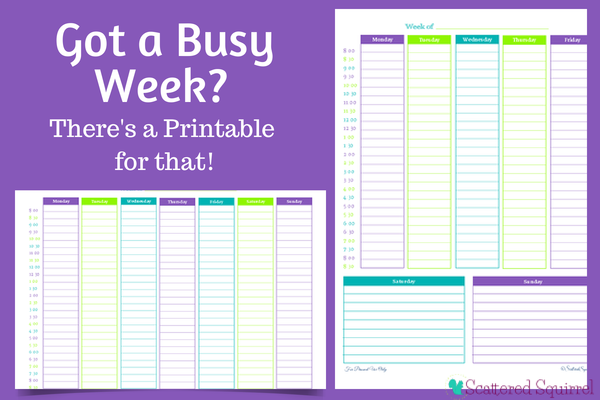 I know that with the addition of these ones, there are now a whopping five printable weekly planner pages on this little blog. The two I shared earlier this year just aren’t working for me anymore. While they still function and work great, I wanted something that would allow me to structure my days. With more and more being added to our weekly routines, I felt it was really important to start scheduling our days. With the half hour increments I can easily block out times for each activity and that will give me a visual reference for how much time in the day I have for the things I need to do. Currently, I’m using the second one in conjunction with the Weekly Overview. I used the Overview to keep track of what was happening this week, my to do list and so on, and I used the Weekly Planner to schedule it all in. The week is still young, but so far this combo is really working out well. As always to snag a copy for yourself, click the pictures! And of course, all printables found here are for personal use only, if you would like to use them for something other than personal use, drop me a line and we’ll work something out. So, what do you think of the planners? Will the work for you? Do you find that the weeks get more and more busy the closer it gets to Christmas? I link up at these great parties. Thank you so much! I have been looking for these for a long time, I have even tried making them myself and I didn’t like how it came out. Do you have the portable size version of this one? If you head on up to the tab at the top of the screen called Printables and hover your mouse, you’ll see another menu drop down. One of the options there is Personal Planner. Click that one and take a peak at the weekly printables in there. I don’t know if I have these exact ones in half-size, but I know I have some and I’m working on some new ones that should be up next month. I hope that helps. i must say i love your printouts they are amazing. On a side note I was wondering if you could make a weekly print out with morning afternoon and evening instead of hours. These are great, exacly what I was looking for. Thank you! 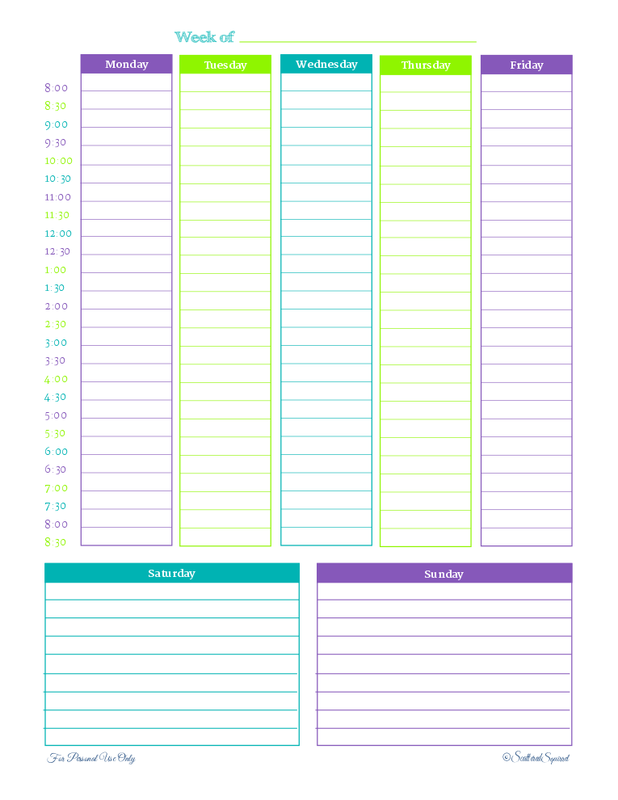 How do you make an hourly planner like this for your self! I love this so much I just wanna customize the colors to fit my liking. Can you give me some tips. Thank you! I use a program called InkScape to design all my printables in. My best advice though is to start with a program you feel comfortable using and see what you can do with it. Play around with different options like lines, tables, shapes, and just have fun with it. I love this!! Found something similar online, but yours was free! THANK YOU!!! Thank you so much Carlee. I’m happy to hear that you like using these planners.